A directory of State Laws that effect the Bail Bond Recovery Industry through out the United States. Below is basic information on bail bond laws for Kansas concerning Bail Enforcement, Bounty Hunters, Fugitive Apprehension and Bail Bondsman. This is not legal advice. Laws change frequently, please check the links provided for possible updates and current information. 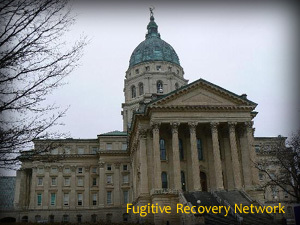 Kansas Statutes Annotated Chapter 22.–criminal Procedure Kansas Code Of Criminal Procedure Article 28.–conditions Of Release 22-2806 – 22-809. At one time, Kansas had very detailed provisions regarding bail in Kansas Statutes Annotated Chapter 61.–procedure, Civil, For Limited Actions Article 3 –arrest And Bail. However, this article was repealed. There do not appear to be any specific licensing requirement for bail recovery agents or anything of the exact equivalent. However, Kansas statutes provide, approval procedures for a “surety.” In addition, the Kansas Attorney General Opinion (below) provides further clarification on what a “surety” is. According to the opinion, non-insurance company bail bonds, or “pocket-bonds,” may only be issued by an individual and not a company. 22-2806’s requirements for surety approval, therefore, may have application and be limited to individuals. Kansas Statutes Annotated Chapter 22.–criminal Procedure Kansas Code Of Criminal Procedure Article 28.–conditions Of ReleasE 22-2806. Every surety, except an insurance company authorized to transact business pursuant to subsection (d) of K.S.A. 40-1102, shall justify by affidavit and may be required to describe in the affidavit the property by which such surety proposes to justify and the encumbrances thereon, the number and amount of other bonds and undertakings for bail entered into by such surety and remaining undischarged and all such surety’s other liabilities. No bond shall be approved unless the surety appears to be qualified. The appearance bond and the sureties may be approved and accepted by a judge of the court where the action is pending or by the sheriff of the county. The regulatory body is the Insurance Department. Office of the Attorney General, State of Kansas. Opinion No. 87-11. Synopsis: There are generally two types of bonds accepted by courts in criminal proceedings. Insurance bail bonds are issued by a licensed surety under the authority of K.S.A. 40-1102. Non-insurance company bail bonds (commonly referred to as ‘pocket bonds’) are issued under the authority of K.S.A. 22-2806. Only a natural person may write ‘pocket bonds’ under the authority and regulation of K.S.A. 22-2806. A company may not write ‘pocket bonds’ under the purported authority of K.S.A. 22-2806 as such action would be in violation of K.S.A. 40-214 and the Uniform Unauthorized Insurers Act, K.S.A. 40-2701 et seq. Cited herein: K.S.A. 22-2806; 40-201; 40-214; ) 40-1101; 40-1102; 40-2701 et seq. Kansas bail agent’s arrest authority. Kansas Statutes Annotated Chapter 22.–criminal Procedure Kansas Code Of Criminal Procedure Article 28.–conditions Of Release 22-2809. Establishes arrest and surrender authority, and procedure, of an obligor by a surety. Any person who is released on an appearance bond may be arrested by his surety or any person authorized by such surety and delivered to a custodial officer of the court in any county in the state in which he is charged. A surety may subsequently bring the arrested person and before any magistrate having power to commit for the crime charged. At the request of the surety, the magistrate shall commit the party and endorse on the bond, or a certified copy thereof, the discharge of such surety. Kansas does not have provisions regarding bounty hunters. Please check with the Kansas’s Department of Insurance, Licensing Board and/or Local Law Enforcement for the most recent updates. If you know of any updates to Kansas’s bail bond laws, please provide as much detail as possible and send to us using our contact form. This information was compiled in 2001 and updated by the Fugitive Recovery Network. Content may not be reproduced, copied or otherwise distributed without express written consent. We prefer and recommend that you link to this page instead.